Routledge Applied Linguistics is a series of comprehensive textbooks, providing students and researchers with the support they need for advanced study in the core areas of English language and Applied Linguistics. Each book in the series guides readers through three main sections, enabling them to explore and develop major themes within the discipline. • Section A, Introduction, establishes the key terms and concepts and extends readers’ techniques of analysis through practical application. • Section B, Extension, brings together influential articles, sets them in context, and discusses their contribution to the field. • Section C, Exploration, builds on knowledge gained in the first two sections, setting thoughtful tasks around further illustrative material. This enables readers to engage more actively with the subject matter and encourages them to develop their own research responses. Throughout the book, topics are revisited, extended, interwoven and deconstructed, with the reader’s understanding strengthened by tasks and follow-up questions. 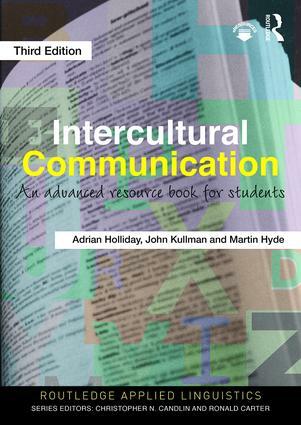 Written by experienced teachers and researchers in the field, Intercultural Communication, Third edition provides an essential textbook for advanced students studying this topic. "Intercultural Communication constitutes a comprehensive resource for students with a solid understanding of the field, who seek to expand their basic knowledge. Beyond revisiting, discussing and problematizing intercultural theory, it also provides thorough guidance from conceptual comprehension and awareness building to critical self-reflection and practical application. I would recommend this book for all students who are ready to engage with intercultural communication on a deeper, more complex level." "The third edition of this widely popular resource book for the study of intercultural communication effectively incorporates recent theoretical developments in this dynamic field through carefully selected new readings, topics, examples and references. The book remains a key source for exploring a wide range of aspects of culture and communication in our increasingly complex world. Students and lecturers will find both the material and the format engaging and inspiring." "This volume draws on contemporary theory and scholarship in applied sociology, psychology, and discourse and media studies to promote insights into the dynamics of intercultural experience and representation. With abundant current resources and engaging activities, it is sure to inspire lively discussion and illuminating reflections about processes shaping intercultural communication." Unit C3.2 ‘Schemas’: fixed or flexible? Adrian Holliday is Professor of Applied Linguistics at Canterbury Christ Church University, UK. John Kullman is a Principal Lecturer in the Department of English and Language Studies at Canterbury Christ Church University, UK. Martin Hyde is Director of Operations for Student Recruitment and Events at PlattForm Education UK. Routledge Applied Linguistics is a series of comprehensive resourcebooks, providing students and researchers with the support they need for advanced study of English applied linguistics and language. *Section C, Exploration, builds on knowledge gained in the first two sections, setting thoughtful tasks around further illustrative material. This enables readers to engage more actively with the subject matter and encourages them to develop their own responses. Throughout the books, topics are revisited, extended, interwoven and deconstructed, with the reader's understanding strengthened by tasks and follow-up questions.